I was bottling beer in the weekend (a nice Miner's Stout) when for the 501st time, the Steinlager bottle I was capping refused to cap as the grippy bit at the top of the bottle neck cracked. You see, as the pressure of the bottle capper comes down, the glass simply gives way. I suspect this is a time / use related issue. Over time, the pressure gets too strong for the glass and it simply breaks. I've also had plenty of bottlenecks completely snap too. So I dumped every green Steinlager bottle that I had into the recycling bin. About 30 of them, collected (and drank!) over the last few years. But it's a real shame as the 750 ml Steinlager bottle is a really nice bottle to hold when pouring a beer into a glass. There's something really aesthetically pleasing about it too. Don't get me wrong though, Steinlager is an excellent beer and one I would recommend to any discerning beer drinker. 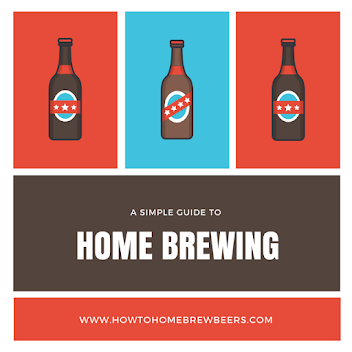 So this got me thinking, what beer bottles are really good for using with home brew? Well, for this brewer, a side effect of the rise in craft beer is that there are a plethora of bottles out there to choose from. I found that most brown bottles of craft beers in New Zealand are able to be capped really quite well. But you know what works the best? 750 ml Tui crate bottles. That's right, the other classic NZ working man's beer has the best bottles for capping homebrew. While I'm at it, I found a great source of getting bottles for homebrew conditioning is by raiding the recycling bins of my neighbours! Also, I'm still pretty happy about my discovery on how to easily remove beer bottle labels. You may have heard of beer kit brewers using 'beer enhancer' before. It's a handy way of giving your beer more body and flavour thus making your beer a more enjoyable drinking experience. But where I come from, a quality beer enhancer will cost you anything from 7 to 14 dollars. Check out the prices on Amazon if you don't believe me! If if you're a bit like me, you want to make good beer but you also want to do it fairly cheaply. Now you could simply use sugar instead of a beer enhancer but then your beer might feel thin and watery. So I had an idea, what if I used a bag of Mackintosh Toffee Lollies as an enhancer? 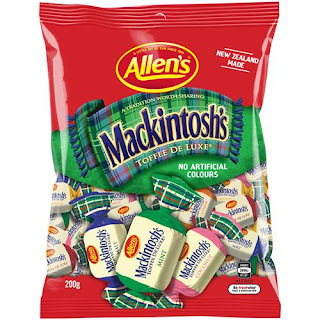 Where I come from in New Zealand, these malty chews are probably one of the most popular treats around. If you haven't picked why I would have this crazy idea, it's because of the malt and sugars that are in them. Given beer enhancer has a main ingredient of malt and dextrose, would this lolly be a good substitute for a beer enhancer? So here's the experiment I ran. I knew I needed to test the effectiveness of the Mackintosh Lollies and I reasoned I needed to use a lager so that any malty flavours from a tin of ale or stout wouldn't mask or overpower any effect of the Mackintosh lollies. A packet of Mackintosh Toffees costs about three dollars in NZ and for your trouble you get 250 grams in the 'farm pack' size. So I figured I would need two packets as my enhancer substitute. That still comes in at 6 bucks and is a buck or two cheaper than a standard enhancer I would use. So given one usually uses about 1 KG of beer enhancer, I also added another variable to the experient. I made up the difference with 500 g of dextrose. Dextrose will be wholly consumed the yeast in the fermentation process so will not effect the 'mouth feel' of the beer but will help the yeast do its job. I wondered about just throwing lollies into the wort but thought better of it. I melted them in a pot on low heat. While removing the wrappers from two packets worth, I wondered if this experiment was even worth my time and effort. So I prepared a lager brew using a Coopers Lager (as I've previously noted how these kits are fairly weak in body without enhancers). I let the batch ferment for a week and then bottled and stored them in the man shed. Two weeks later I placed a couple of bottles in the fridge and the next evening I sampled my experient. Had the toffee lollies worked as a beer enhancer? My first impressions were how sweet the beer was. And then I realised the mistake I had made. The Mackinstosh lollies had all kinds of flavours such as mint, harrogate and coconut. I could certainly get a sense of these flavours. Not bothersome but there none-the-less. And then I noticed that the lager had a small amount of body to it. Nothing huge but it was there. The head didn't retain for very long. From my experience of using a Cooper's lager kit with an enhancer, I could tell that the toffees had added some substance to the beer. So, a successful experiment from the point of view that the lollies added some mouthfeel to the beer but would I recommend this for future efforts? If I wanted to save a couple of bucks off the price of a standard enhancer, then sure. But in terms of time and result, it's not worth it. It took about ten minutes alone to remove the wrappers and then a similar amount of time to melt down. If I'm making beer from a kit, I just want to get it done as quickly as possible. And given that a beer enhancer does a more efficient job, I don't really recommend you use Mackintosh toffees as beer enhancer! The best way to get labels off beer bottles is by... putting them in the dishwasher. Now you can get on with easily bottling your beer. Trust me, I've considered how to remove labels from beer and wine bottles before. I had ideas along the lines of giving the bottles a good old overnight soak in products such as sodium percarbonate, powdered Brewery Wash, ammonia and even baking soda. I'd even contemplated using steam from a kettle. And they all work to a certain degree but all involve labour and mess and scrubbing to various degrees. But using the dish washer makes peeling off labels so easy! Here's how I discovered this most obvious solution to a problem that frustrates many brewers. I was rinsing the dishes last night and on the window ledge above me was a bottle with a label that I'd placed their the night before - and it had label I knew was going to be a real pain to remove as I'd suffered through that brand before (Boundary Road from NZ). A soak would not be enough, some firm scrubbing was going to be required. So as I loaded the dishes into the dishwasher, on a whim I placed the bottle into the dishwasher and let it do it's thing. I was thinking about that steaming idea. You know how people apparently use to open letters by using the steam from a kettle as the glue would soften? That's the idea. Now, I'm the kind of guy that likes to have the dish washer emptied before I go to bed so I don't have to empty it in the morning. So I opened it up when the wash was through and the first thing I noticed was the brown bottle, with the label 9/10 removed and slipping down the bottle. The dishwasher trick had worked! I was able to quickly peel off the label while the bottle was still warm from the heat of the dish-washing process. There was a little bit of residual glue on the glass. A quick scrub with the dish-washing brush and it was removed. Not a challenge at all. The easiest removal of a beer bottle label I'd ever done. No more soaking bottles with chemicals for me. When I need to remove the labels, I'll simply use the dishwasher to help. This will also have the benefit of helping clean the bottles (not so much the inside maybe) and at the very least, the heat of the dish washer will help sanitize and even sterilize the bottles too. Off course for those without a dishwasher, soaking is still going to be the best way to peel those labels off!